WALL-E is set in 2805, a period when Earth is nothing more but a land filled with piles of garbage left by the megacorporation Buy ‘n’ Large. It is only the robot WALL-E, a trash compactor robot, which has been left after humans are evacuated from Earth a hundred years before. The robots mission to deal with the planet’s entire trash failed and there is only now a single robot that still works. One day, WALL-E finds a seedling among the trash. Not long afterwards, a robot called EVE comes out from a spaceship that has been sent to Earth. EVE has been programed to search for any kind of vegetation in the planet. WALL-E falls in love with EVE. EVE, who is as stiff as any robot can be, eventually learns to like WALL-E. When WALL-E show EVE the scraps of trash that he’s been collecting, she sees the seedling which she automatically reaches for and places inside her body. She then goes into standby more. WALL-E gets confused and tries everything to wake up EVE. EVE’s ship arrives and retrieves her while WALL-E sneaks inside so that he can follow EVE. The spaceship goes to Axiom, where the descendants of the former Earth resides. These humans are very fat due to the microgravity effects of the large ship where they live. When EVE returns, the captain learns that the plant signifies that Earth’s habitability and the moment that it happens will set the Axiom to go back to Earth so its passengers can repopulate the planet again. However, the ship’s computer system, AUTO, commands another robot to steal the plant in accordance to the no-return directive released by BnL after they previously assumed that Earth can no longer be inhabited. After the plant has been taken from her, EVE is sent to repairs. WALL-E thinks that she’s being torture and he tries to save her. In the process, he manages to free defective robots which start roaming around the ship. Because of this, the security system of the ship considers WALL-E and EVE as rogue robots. EVE sends WALL-E through an escape but not before they see AUTO’s assistant robot trying to get rid of the plant. WALL-E saves the plant from the pod it is placed into before it can explode in space. WALL-E and EVE bring the plant to the captain. EVE’s data about Earth make the captain decide that the moment has come for humans to return to Earth. AUTO opposes his decision and still tries to destroy the plant. WALL-E prevents it but he gets heavy damage in the process. 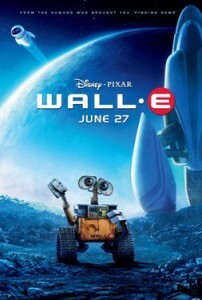 EVE realizes that she can only fix WALL-E with materials that can be found on Earth. She brings the plant and WALL-E to the holo-detector while the captain fights prevents AUTO from doing further damage. EVE successfully brings back WALL-E to Earth and starts patching him up. To her disappointment, WALL-E’s memory has been erased. EVE bids him farewell with an electronic kiss which brings back the original WALL-E. The movie ends with the arrival of humans on Earth with goals of restoring it.